NW Running Boards now offers Classic Soft Trim’s high-quality leather trimmed interiors. These interiors are handcrafted in their manufacturing facility which has attained the ISO-9001 quality standards registration. This helps to assure that each interior meets or exceeds O.E.M standards. 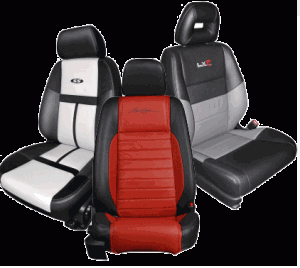 Classic Soft Trim‘s is considered on of the best in aftermarket leather-trimmed interiors. The same products the dealership offers without the price! SELECTING THE LEATHER: hide is handpicked from the finest automotive grade leather. Consistency in color, grain and overall appearance determines the hide selection. INSPECTING THE LEATHER: Each leather hide must meet our rigorous O.E.M. standards. Quality assurance tests include color, durability, flammability and shrinkage. Matching vinyl trim is selected based upon the color tolerance range of the leather hide. DESIGNING THE INTERIOR: From factory seating, our design staff creates a distinctive look for every pattern. Designers also indicate 2-tone options for customers who choose to customize their interior. CRAFTING THE INTERIOR: All pieces of the covers are precisely cut using state-of-the-art laser cutting technology. Experienced sewing technicians skillfully stitch the new leather covers with O.E.M. fit and finish. INSPECTING THE INTERIOR: The leather covers are meticulously inspected throughout the cutting and sewing process. Before boxing the finished interior, seasoned inspectors check the final construction before placing their personal stamp of approval on each Classic Soft Trim cover.